Disclosure: I am a Once Upon a Farm ambassador, but all thoughts and opinions are my own. Recently, I took my little one to the most magical place in Los Angeles… the Wizarding World of Harry Potter at Universal Studios Hollywood! There’s nothing quite like Wizarding World – it’s a completely immersive experience, from the cobblestone streets, the music, buildings and window displays. It truly feels like you’re walking into a Harry Potter book! When visiting theme parks and going on adventures with my 3-year-old, packing lots of healthy and tasty snacks are a must! 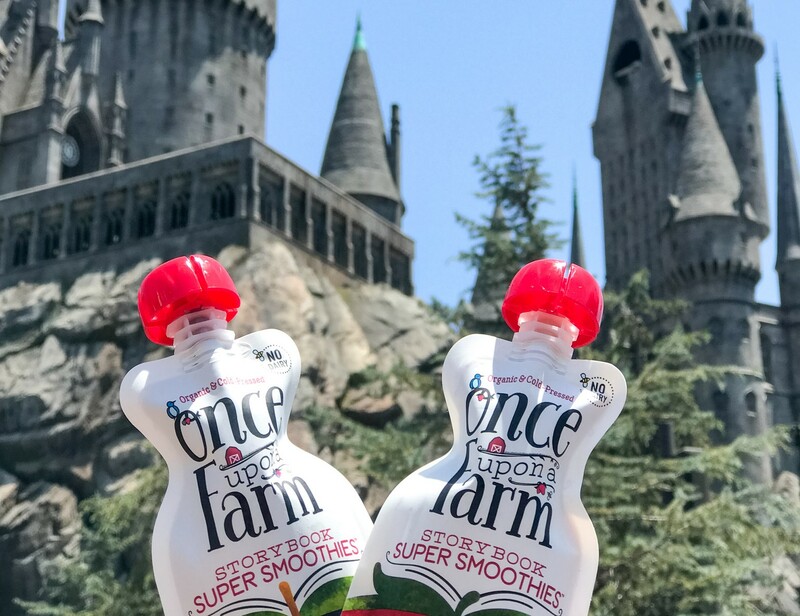 For our trip to Wizarding World of Harry Potter, I thought what better snack to bring than Once Upon a Farm’s Storybook Super Smoothies for our storybook-esque trip? Once Upon a Farm Storybook Super Smoothies are my personal favorite product that they make, I quite enjoy them along with my 3-year-old! They come in Strawberry Banana Swirl, Berry Berry Quite Contrary, Appley Eating Greens, and Coco for Mangoes. My daughter loves the Strawberry Banana Swirl and Berry Berry Quite Contrary, my favorite is Coco for Mangoes (I just love anything coconut). They’re a perfect smoothie-on-the-go, with no blending required! Also a big plus? Since they’re in a pouch there’s no mess when my 3-year-old is enjoying a Once Upon a Farm Storybook Super Smoothie, versus having a traditional smoothie in a cup with a straw. She can easily enjoy it on her own mess-free! Enjoying her snack while watching the Wizarding World stage performances and seeing Hogwarts on top of the hill was quite the magical, storybook experience! And the fact the Super Smoothies we brought along were cold-pressed, dairy-free and no sugar-added were a big plus too!